Overview of the Croatian Real Estate and Tourism – Trend is showing that in the last few years, Croatia has emerged as new tourist star on the European sky. The infrastructure has been transformed, improved, good quality roads now link north and south, airports in Split, Dubrovnik, Zadar, Pula connect coastline with all Europe and the country has been put on a sound footing, Which, in return, attracts more and more visitors interested in buying property. The country is divided into numerous different regions, however most property buyers tend to want to buy their property in the coastal areas of Istria and Dalmatia. This is a land of medieval towns safe within high walls, breathtaking scenery, and an extraordinary mix of culture and history. Croatia’s mainland coastline is around 1,770km long and in addition has around 1,244 islands lying off it, which is one of the major tourist attractions. The Adriatic coast leans towards beaches that are rocky or pebbly rather than sandy, however, there are some sandy beaches as well, for those who prefer them. Sea water is clean and crystal clear. Potential homeowners are given a real à la carte menu of the variety of landscapes to choose from. Spending holidays in different regions is helpful in making a final decision and if you are able, try to visit at different times of the year so that you are aware of what the winter climate and atmosphere are like. We are happy to help you spend your holidays in some of our collection of more than 500 top Croatian villas which we have in offer for rent. After your first experience of Croatian beauties, be sure to find your new second home in Croatia in our offer of more than 1000 properties for sale. Each day we add new properties for sale. Croatia is top tourist destination in Europe, Croatia is European union country. This well known part of Croatia has vineyards, olive groves, a number of national parks and tranquil seaside towns on the mainland and islands, such as Dubrovnik, Split, Primosten, Trogir, Omis, Makarska, Cavtat, Orebic, Korcula, Supetar on Brac island, Hvar, Vis, Rogoznica, Zadar etc. Small seaside resorts like Orasac, Brela, Baska Voda, Igrane, Rogoznica etc. attract visitors who enjoy the wonderful scenery and a quiet lifestyle. There are plenty of restaurants in the summer period. Number of cities are protected UNESCO heritage like Dubrovnik, Split, Trogir, Porec. Dubrovnik region is rich with old summer mansions and luxury villas for sale and rent. You can view our Dalmatian and other coastal property listings for sale here. Split is the capital city of Dalmatia, and with its position at the heart of the country, has played a pivotal role in the history and identity of Croatia. Famous Split heritage site is the Roman Emperor’s Diocletian’s Palace, built in 3rd century and is one of the rare examples of Roman architecture preserved in all its glory. Brac, Hvar, Vis and Korcula – some of the biggest and most visited of the Dalmatian islands, located off the coast of Dalmatia. 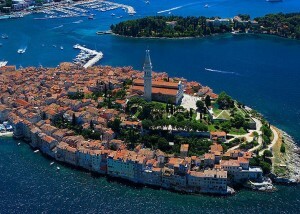 The Istrian Peninsula is the most northern part of Croatia, and borders the country of Slovenia. This part of the country has proven very popular with visitors, thanks to its beautiful countryside, richly forested interior and attractive coastline. The old town of Umag is set on its own riviera, which stretches for about 20km. This is an especially pleasant part of the coastline. Possibly the last area to come to the attention of the overseas property industry, Istria has seen a sharp growth in property buyers from the EU since the Croatian accession. in the past couple of years. As buyers are keen to find the best deals and discover untouched areas of the country, they have spread north from the bigger cites to discover the resorts and the old Venitian-style towns further up the coast. Low-cost airlines are beginning to fly into Croatia, with Pula in Istria as the main destination airport in the region. Porec, probably the most popular resort in Istria, dates back some 2,000 years and is well worth a visit, while the town of Rovinj, which was originally on an island, is home to many restaurants and cafés and is also a busy fishing port. Make sure to check out our Istrian properties for sale and rent! Further down the coast from Istria comes the middle section of Croatia, the Kvarner region. Opatija and Crikvenica have a great deal of charm left over from former times. Opatija, especially, is home to some lovely buildings dating back to the Austro-Hungarian Empire, when it was a fashionable seaside resort. Crikvenica is known for its long beach and mild climate, which is reputed to be beneficial for those with respiratory problems. One of the most important (and busiest) Croatian ports, Rijeka, is also located here. This is pretty much a starting-point for anyone wanting to travel by ferry further down the coast or out to the islands. Also to be found in this part of the country are the islands of Krk, Pag, Rab and Cres. We have a nice variety of properties for sale in all of Kvarner, especially the island of Pag & Rab.